The Little Prince by Joann Sfar. Review: Draw me a sheep. Does this sound familiar? It may if you have ever read The Little Prince, but the version I read is different. Instead of a book, this version is actually a graphic novel written by Joann Sfar. A graphic novel is more like a comic book with a lot of pictures and fewer words than your typical storybook which makes this a short, good read. In this story, a pilot's plane breaks down, and he lands in a desert. As he fixes his plane, a boy comes up to him and asks the pilot to draw him a sheep. After several attempts to draw the boy the sheep he wants, the little prince is finally content with a picture of a box which the man states has the sheep inside. The boy explains to the man that he wants to take the sheep back to his planet. He then proceeds to tell the pilot about his planet and a beautiful flower that grows there. The flower is very demanding and upsets the little prince so he decides to leave his planet. The prince travels from planet to planet, meeting strange people at each stop. Lastly, the prince came to Earth, but before meeting the pilot, he saw more flowers like the one on his planet and then he meets a fox. The fox told the prince that he is responsible for his flower, and that made the prince want to be with his flower. Then that's when he met the pilot. The pilot grew fond of the little prince and wanted to stay with him, but the prince felt he needed to go back home to his own planet and his flower. Did the prince make it back to the flower? Well, you will have to read it to find out. The Little Prince graphic novel is a good book for ages 8 and up. Many older people will also like it especially if they have read the novel version of the story. The book is a pretty fast read with great illustrations. It also has many mysteries that keep you engaged. If you like reading but find large storybooks to be a bit overwhelming, this book, being a graphic novel with few words and many pictures, is a perfect choice. There are touching parts that will make you happy and you find yourself caring about this strange little boy from another planet. 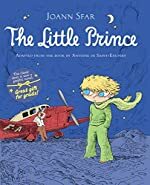 So when you are looking for a short yet entertaining story that is fun for all ages look no further, and read The Little Prince. We would like to thank Houghton Mifflin Harcourt for providing a copy of The Little Prince for this review. Have you read The Little Prince? How would you rate it?